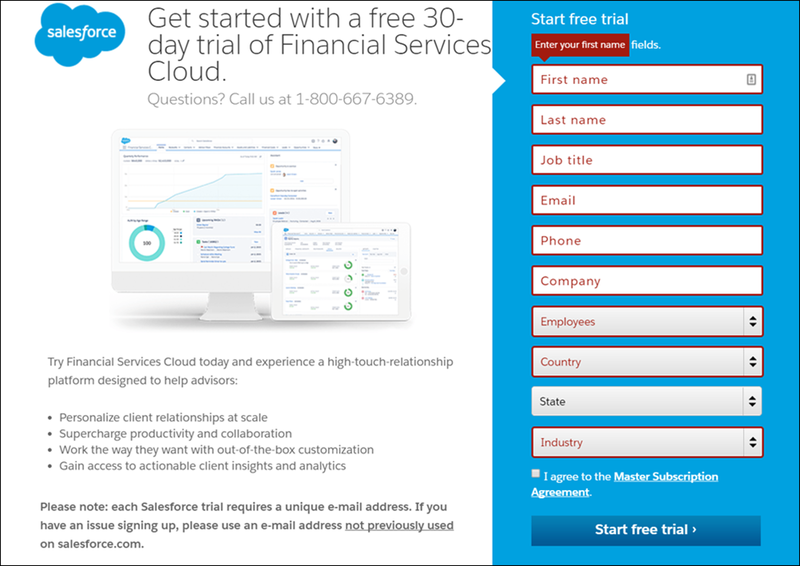 Install a free 30-day trial version of Financial Services Cloud. Set up Financial Services Cloud to turbocharge your users’ productivity. Now that you’ve learned all the cool things Financial Services Cloud can do, how about taking it for a spin with our free trial? You get preconfigured and preloaded sample data so you can start playing around in your new org right away. Once you’re done testing it out, you can transition your trial org to a production org with the help of your account executive or solution engineer. No additional installation required. Ready to get your hands dirty and set up your own world in Financial Services Cloud? Let’s get you registered now. Only one caveat—when you register, use an email address that is unknown to Salesforce. We suggest that you create a brand-new email account for the registration process. Here’s a quick video that walks through a trial registration so you can see what to expect as you do it on your own. Afterward, we guide you, step-by-step, to make sure you’re registered and ready to go! Now that you’ve seen someone step through it, let’s get started on registering and setting up your own trial version. Sign up for the 30-day trial using this form. Fill out the form using your own values. The email address you provide becomes the username in this new trial org, and usernames must be globally unique across all instances of Salesforce. So, you must use an email account that is unknown to Salesforce or your installation won’t work. Before you do anything else in your trial version, verify your account by popping over to your email. Got the email? Good. Didn’t get it? Wait a minute or three, and maybe check your spam filter. Check again. The email is there now, isn’t it? If you still don’t see it, contact Salesforce. All right, now that you’ve looked at all that, click Verify Account to set up your password. Pick a security question and answer, and click Change Password. Now that you’re registered, let’s see how to set up your trial version. Before you do anything else, you must set up and deploy your domain. Here’s how. In the Quick Find box, enter My Domain. Your domain is your home URL on salesforce.com. You can use it for all kinds of fun things like the following. Let’s go over the rules for naming a domain. As you choose a name, consider the following. Don’t use these reserved words or acronyms: www, salesforce, or Heroku. Don’t start your domain name with the words root or status. Domain names can be up to 40 characters long. Names can’t begin or end with a hyphen. What to name your domain? Since this domain is for your trial installation, use something personal. If you plan on transitioning this org to a production org, use something more professional. Keep in mind that you must contact Salesforce customer service to change a domain name later. Enter your subdomain name and select Check Availability to see if it’s already in use. Once you confirm that the name is available, click Register Domain. It takes several minutes to register your domain and send you a confirmation email. This is a good time to grab a cup of coffee (or tea). Now your domain is registered. Confirm the registration, then deploy the domain to your users to roll it out so you can enter the wonderful world of your own domain. Here’s how. You’ll receiving an email today showing you great information on how to maximize your 30-day trial. This email sometimes appears ahead of the email from Salesforce support instructing you to deploy your domain. We know you're excited to get started, but we want to make sure your trial org functions correctly. Be sure to wait for the email from support@salesforce.com before you click any links. This email has a subject line like "Salesforce domain ready for testing." Follow the instructions in this email to deploy your domain, and then you are free to explore the trial org to your heart's content. To log in, click the link in your domain registration email and log in with the username and password you used to create the domain. (Optional) Register with your mobile phone. In the Quick Find box, enter My Domain and select My Domain. Once you’re on the My Domain pane, click Deploy to Users. Salesforce asks you if you’re sure you want to deploy the domain. Click OK. Your domain is registered and rolled out, and you’re ready to move on to the next step. Your trial version of Financial Services Cloud is integrated with its own built-in AI genius named Einstein Analytics. To make it work, make sure that Einstein gets the data it needs. How? Set up a regular dataflow to transfer data from your Financial Services Cloud to Einstein Analytics. From the Analytics Setup menu ( ), click Data Manager. From the picklist, select Dataflow View. In the Financial Services Cloud Dataflow, select Schedule from the picklist. Schedule the dataflow as needed, for example, every Sunday at 4 AM in the Los Angeles time zone. How often? It depends on how often the data in your Financial Services Cloud gets updated. You can always change this setting later. If you’d like to receive an email when your dataflow completes, click Send email notifications. Save your changes. Your dataflow is loaded every day at 4 AM, but let’s load it now so you can see what Analytics discovers in the sample data. In the Financial Services Cloud Dataflow, select Start from the picklist. To check to see if your data is loaded, press Refresh . It can take several minutes for your data to load. When the data is loaded, the icon changes to a hexagon with a checkmark. If you don’t get the green checkmark after several minutes, refresh the page, and then select Dataflow View from the picklist again. Now that you have your org up and running, how about adding some users? As the one who has set up the system, you’re an admin and your user is automatically created. Unless you’re a one-person organization, you must create user records for everyone who is going to access the system. Then assign permissions to those users to give them the level of access they need. Let’s create a fictitious user and assign that user appropriate permissions to access Financial Services Cloud. Then you can follow this procedure with your own users later. From Setup, click the App Launcher icon ( ) and select Wealth Management. Enter Users in the Quick Find box, then select Users. For First Name, enter the user’s first name. For Last Name, enter the user’s last name. For email, enter the user’s email address. For username, you can enter a different email address or use the email address you just entered. Remember that username must be unique across all instances of Salesforce. For Role, select None Specified. For User License, select Salesforce. Leave all other defaults as is and click Save. What do you want the user to have access to? You can’t go wrong starting with the basics, and you can always add more permissions later. First, assign the user the correct permission set license to give the user has access to the correct permission sets. Click the App Launcher ( ) and select Wealth Management. In the Quick Find box, enter Users, then select Users. Click the user that you created in the previous step. Hover over Permission Set License Assignments and then click Edit Assignments. Enable the Financial Services Cloud Standard and the Analytics Embedded App permission set licenses. Now you’re ready to assign the correct permission sets to your user. Back on the user page, hover over Permission Set Assignments and then click Edit Assignments. From Available Permission Sets, select Advisor Access and then click Add. From Available Permission Sets, select Financial Services Cloud Standard and then click Add. From the App launcher in the upper left corner ( ), choose Wealth Management (click back to Home if you don’t see it). Up pops your sparkly new trial version, complete with sample data. Once you start working with Financial Services Cloud, the home screen changes to reflect what’s going on. Here’s an example of a home screen with more data in it. Your adventure is just beginning. Now that you have a brand-new Financial Services Cloud org to play with, let’s learn how to customize it to better suit your needs.